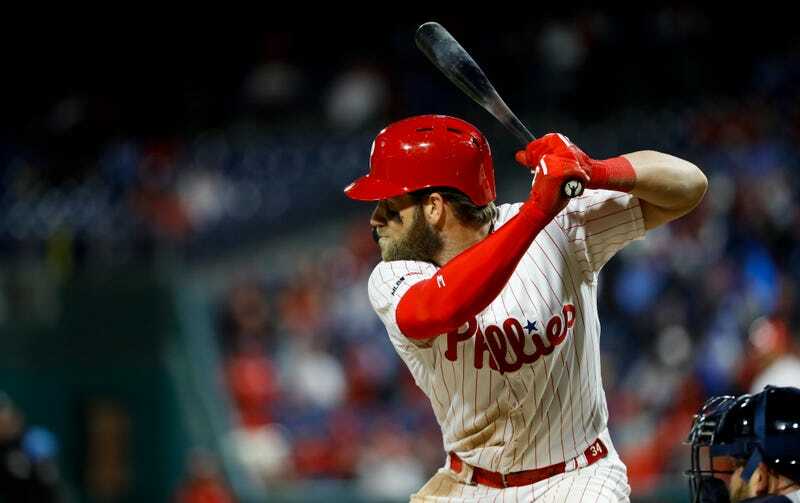 Tuesday night the Phillies travel to Washington, and with them, their new superstar Bryce Harper returns to the city where he spent seven extremely productive seasons and became the face of the Nationals. But D.C.’s relationship with Harper, especially in the later years, was increasingly fraught, so it’s going to be very interesting to hear the cheer/boo proportions in the home crowd. For those Nats fans still making up their minds on whether to blame Harper for leaving or thank him for the good times he provided, here’s some pertinent information. The Washington Post has a tick-tock of Harper’s free agency, which ended with a 13-year, $330 million deal with Philadelphia. The piece’s most interesting revelations are the details and dramatics of the Nationals’ two offers to Harper, one while the season was still going on, and one in January. The former was, somehow, better than the latter, which is not how negotiations generally work. During a rain delay in the Nats’ final home game, Harper was summoned to the manager’s office only to find the owners waiting for him. Harper was still in his uniform. The game hadn’t yet been called, but he was about to have a business meeting. At that time, the Nationals were the only team that could offer him a contract. The Lerners said they loved Harper, that they wanted him to be part of their future. They handed him an envelope. Harper was stunned. “Aren’t you going to open it?” someone asked him. Harper said no, not yet. There might be more baseball still to play. They shook hands, thanks all around. When the game was finally called, Harper huddled with his wife outside the clubhouse and finally opened the envelope. The Nats’ offer was for 10 years and $300 million—which the Nationals promptly leaked to the media, because on its face it was a sound first offer—but with $100 million of that deferred over the next 33 years, significantly reducing the amount of the deal. The Nationals didn’t leak the part about the deferred money. Harper tells the Post he thought the offer was a good starting point for negotiations. But those negotiations never really developed. Harper met with the Lerners again two days before Christmas, and conveyed to them his desire for a longer term, even, he says, at a smaller average salary. After New Year’s, the Nats’ second offer arrived. It was for 12 years. Good. It was for a smaller AAV. Fine. It was, shockingly, for less total money than the first offer, despite covering for two more seasons. And deferrals made it even worse than that. 12 years for $250 million, according to one person with direct knowledge of the terms. Much like the proposal they made to Harper before the season ended, some of the money was deferred. The last payment from this contract, according to the person, would have come in 2072. The deferrals lessened the net present value of the contract considerably, although the ­Nationals and Boras’s team differ in their calculations. Boras’s team told Harper that, using a 6 percent discount rate, the new contract offer was worth just more than $107 million. “I got that offer, and I kind of was like, ‘Dang,’” [Harper] said. That was the last offer Harper received from the Nationals. It’s not hard to read the tea leaves of those two contract offers; it certainly wasn’t hard for Harper. By the time 2019 rolled around—two months before he actually signed—the Nationals had decided they didn’t want Bryce Harper back. I hope Nats fans keep that in mind. Bryce Harper At His Phillies Press Conference: "We Want To Bring A Title Back To D.C."